Dal Chenille du Jardin is a part of the bright and colorful Alice du Jardin series that was released in 2012. Alice du Jardin literally translates from French to mean Alice in the garden, Chenille is French for Caterpillar. While many Alice in Wonderland themed dolls have been released over this year, this is the only time that a doll has been released based on the character of the Caterpillar. 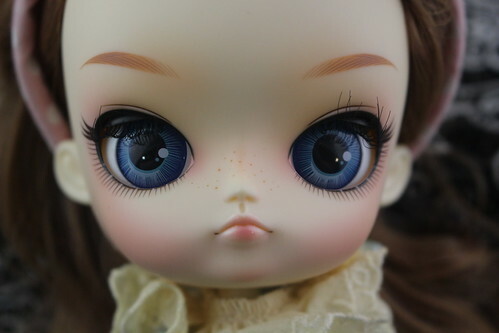 Other dolls in the Alice du Jardin series include Pullip Alice du Jardin, Pullip Alice du Jardin Mint, Byul Cheshire Cat du Jardin, Isul White Rabbit du Jardin and Taeyang Mad Hatter du Jardin. Feel Like So: Who are you? I want you to give me an explanation in a way that I will understand!!! 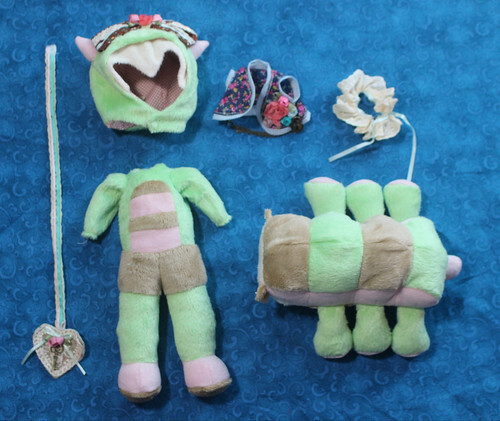 Stock: Dal Chenille du Jardin’s stock outfit consists of a caterpillar suit with “caterpillar body” attachment, a caterpillar hood, vest, sash with heart and a neck ruffle. Special Notes: Dal’s first time with freckles! Known Issues: Animal suit can be a difficult to get on and off. 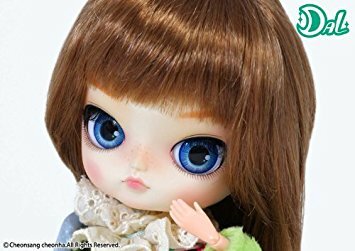 Similar Doll Recommendations: Other dolls from the Alice du Jardin series including Pullip Alice du Jardin, Pullip Alice du Jardin Mint, Byul Cheshire Cat du Jardin, Taeyang Mad Hatter du Jardin and Isul White Rabbit du Jardin.